A new week, a new day, a new start! I haven't felt this charged in a really long time and it feels good. I have been concentrating on putting positives energy in, reading inspirational things and trying to find some good "energy currency" to charge my batteries and I think it is working. One of those light bulb moments happened for me when I took Heidi Swapp's energy journal class. She gave us lots to think about involving energy currency and how it effects our energy levels. (and I have been enjoying the journal I made during her class) I love how Heidi looks at certain things and shares her discoveries through her classes. If you don't know, Heidi is doing free web shows almost every Wednesday evening at 9:00pm eastern time. She has done glimmer misting, mini books, silhouette tutorials, and other things. Well, this Wednesday she has Rhonna Farrer joining her and they are going to be talking about digi stuff and how to implement that into hybrid works. Plus I think there is going to be a really cool brush set from Rhonna that we will get to see first! I look forward to these web shows and have found that they leave me creatively charged and ready to work. Positive energy in! It's also an hour that I set aside for myself to relax, unwind and enjoy the virtual company of other women who share a passion for this crazy thing called Scrapbooking! So if you haven't joined in...what are you waiting for. Make a date to join in this Wednesday evening. 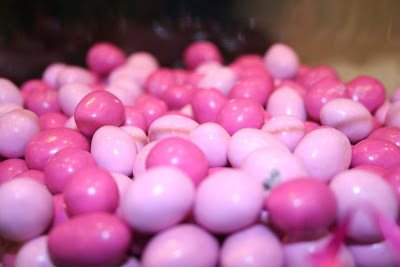 Pink M&M's...love them...they make me happy...they taste better, wink...just had to share!